Are you a professor or teacher in a community college, vocational or four year institution who is unhappy with the content being forced upon you by the major text book publishers? Do you have an idea on how to develop better course materials for your class? If the answer to these questions is yes, then we want to talk to you. 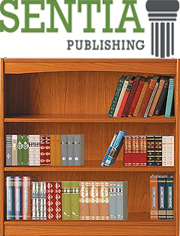 Sentia Publishing wants to develop texts, ebooks, supplements, Web products, and ancillaries in your discipline. We are not a vanity press. You do not buy anything from us and you are not on the hook for anything financial. We just want to make your dream a reality. Sentia will provide the full range of publishing services - copy editing, cover design, typesetting and internal design. We also pay above average royalties for all sales! You control the editorial content, meaning you decide length, message and educational direction. Is your idea for a book or ebook not to be used in a course? Great! We want your mass market book ideas as well. We offer full publishing solutions for mass market books, fiction titles, self help books, personal and family histories, and any other ideas you have. Our process is simple and much less expensive than vanity press services such as LuLu and WordClay. We also offer nationwide shipping and order fulfillment. Take the first step and fill out our form - we'll respond the same day. Get your project started today. Submit a book idea. Thanks to Dr. Robert Tracy for his kind words on his recent project with us, "I find William England, CEO and President at Sentia Publishing, a refreshing entrepreneur in the field of digital media who has his gaze firmly fixed on the logical future of electronic media. Partnering with Pearl Production and PlanView Marketing Communications, William England is effectively guiding Sentia through the volatile print and tech-based field of education publishing. I applaud the efforts of Mr. England and his staff for the work they are doing in academic/scholarly publication. I also express my gratitude for all of their efforts in helping me bring this book to press."